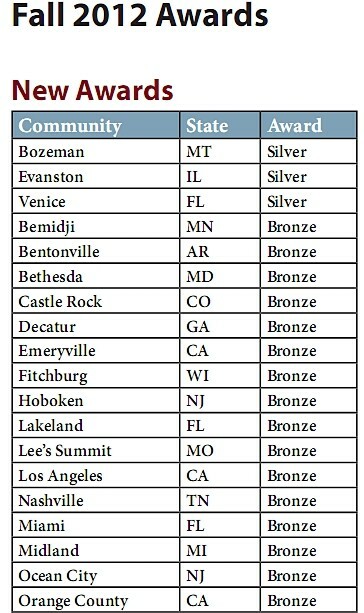 On 10/18/2012 Orange County was awarded a Bronze Bike Friendly Community award from the League of American Bicyclists as you can see from the snippet of new awards. Despite our coverage of injuries and fatalities in the best and worst cities in the county, we’ve also been hard at work at some of the positive aspects of cycling in the County of Orange. Moving from Honorable Mention to Bronze has not been easy, and required a lot of time and dedication on the part of many to get to this point. Activities in District 4 under the leadership of Shawn Nelson calling for cities to collaborate on connected bikeways and actually doing something about it certainly helped in detailed league feedback. Partnering with the OCTA, the OCBC brought stakeholders to the table to submit the application and guide the process forward. Specifically, Dan Hazard (co-founder of the Huntington Beach bicycle Advocates (HuBBA)) and Pete Van Nuys of the OC Bicycle Coalition, Sandy Boyle, Carolyn Malmorado, and Wes Parcel of the OCTA formed the core, and brought a dozen or so local bicycling experts to review the application and make suggestions, with others that provided credible and enthusiastic endorsement for a bronze award. Not one mayor was harmed by a taxi in our upgrade to bronze, although we note the City of Los Angeles also was awarded a Bronze award under the leadership of hizzoner Mayor Antonio Villaraigosa as covered by bikinginla. Looking forward, there’s a lot of positive momentum here in the OC despite some recent setbacks. For example; this week the City of San Clemente’s Planning Commission voted to adopt, with some minor amendments, an 88 point draft of the Bicycle and Pedestrian Master Plan that will be incorporated into the Circulation Element of San Clemente’s updated General Plan if approved by the City Council sometime early next year. Once approved by the Council, the documents head north for legal review by the State Attorney General’s office and if everything is in order, sent back to the City Council for formal adoption probably around May at the earliest. Any delay anywhere along the line slips the probable adoption date and the resultant benefits that the plan would provide. Due to the lengthy time involved in crafting, negotiating, reviewing, amending, and all the other fun like public review and comment, cities in the OC contemplating updating their circulation element with a bicycle plan as part of their General Plan update should quit the contemplation, and get started now. With more cities adopting bicycle plans into their circulation (and even land use) plans, and coordinate and collaborate with their neighbors in connecting commuting bikeways, we may have a shot at earning a Silver! According to the people that hand out the awards, cycle-commuting in BFCs tends to increase faster than non-BFC’s, thus reducing pollution, decreasing congestion, and generally providing a healthier and more sustainable quality of life in addition to driving up the national cycle-commuting average ; which in turn leads to more BFCs, more cycle-commuting…well you get the idea. In other words, a BFC designation increases the likelihood of a positive feedback loop to the betterment of all. While it’s nice to have the whole County be recognized from the outside, we’ve got more work to do so we’ll get back to it. Thanks to all who’ve helped bring the County to this point, clearly we’re on the right track, and we look forward to your continued support going forward. Whether or not you bike in Newport Beach, come to the meeting tonight to voice your support for the Bike Safety Improvement Fund and the offer of a 3:1 match to the fundraising efforts of the Newport Beach Memorial Ride. If approved, funds raised will be matched, thus leveraging your contribution by a multiple of 3! Benefits realized through this action will be quick response to identified safety issues throughout the city – and there are plenty of them! With your support through this dedicated fund, issues will not linger and fester due to other funding priorities. This in turn, limits the City from potential liability by acting quickly to remedy serious safety concerns, which provides you, rider or not, the fiscal safety of your City’s budget remaining intact and not at the mercy of the next bicycle rider killed or injured. The meeting starts at 7:00 p.m. (or 19:00 if you prefer), in the Council Chambers at 3300 Newport Blvd. and the agenda item is last on the list of current business. Stand up for Safety! Newport Beach is the 3rd deadliest, and 5th most injurious city to ride a bike in Orange County. With the right leadership and community support, it can blossom into a city that’s fiscally stable, and able to handle increased density growth, while at the same time becoming a cycling destination area. We note and commend the Newport Friends of the Library for raising $187,000 to go along with the Library’s $500,000 expansion and improvements. While we hope innovative and cheerful cycle racks are included, we have to ask, “Can you ride to the Library safely”? If you missed riding in The Tour, the Olympics, or even if you rode both, stretch your legs at a fundraiser on one of the 4 routes offered at the 2012 OC Gran Fondo. While primarily a fundraiser for “Be A Hero Become A Donor” foundation (BAHBAD) and St. John Neumann Youth Ministry, there’s lots of free goodies and support along the various routes, and a pasta meal at the end! Not enough? How ’bout this: 101 and 64 mile riders will receive a free RACE CUT jersey by Hincapie, while the 11 and 30 mile riders will receive a free high quality OC Gran Fondo water bottle! If that’s not enough, Bianchi has a special offer for new bike purchases. Update 9/24/12: Latest registration, parking, and Ride instructions are posted here. If you missed this year’s ride because you’re in the Tour de Cure, mark your calendar now for the OC Gran Fondo happening on October 5th, 2013. Register before September 1st because prices go up after that. If you want to guarantee your jersey size for the ride, please register by August 17th. Much more info at the website. Ride strong, ride safe, have fun. Updated:09:42 – Suspect Michael Jason Lopez, male Hispanic, 39 year old resident of Anaheim was arrested for 192 (c)(1) PC- Vehicular Manslaughter with Gross Negligence around 02:00 this morning in Anaheim. He was booked at the Newport Beach Police Jail and is being held on $100,000 bail. Investigators are pursuing investigative leads and, in order to maintain the integrity of the investigation, the Department will not release any further information at this time. Newport Beach Police Department personnel, with assistance from other Orange County law enforcement agencies, worked tirelessly since the incident occurred to bring the suspect into custody. They will continue these efforts throughout the investigation to insure justice will be served. Newport Beach police arrested a suspect early Tuesday in connection with the crash that killed cyclist Catherine Campion-Ritz riding on Newport Coast Drive. Our thanks to the diligence and hard work to find and arrest this suspect and recover the vehicle.